What can be said about The Giver by Lois Lowry? This is what good young adult fiction is. And it's dystopian! Jonas lives in a community where everything is carefully regulated and all choices are made for people. They are told when to sleep, what to eat, when to exercise, even who to marry. The people are kept in a state of near childishness where bad things are kept from them. They are married but not really 'married.' They do not have their own children but ones are chosen for them to raise. They have little attachment to each other. The smooth running of the community is everything and anything unpredictable could upset the balance of things. Even strong emotions. Jonas is becoming a Twelve, which means his career is being chosen for him. Everyone is shocked when he is picked to be the next Receiver: a complicated position which requires one person remembering the history of all the world, including the painful stuff, and keep it from the other people. It's a bit of a mind bender but you'll get it. The present Receiver is now the Giver because he gives Jonas his memories. Of course Jonas's mind is opened to a whole new way of thinking and feeling. A way that his family and friends can't relate to. You can only imagine what this does to him. The Giver is what Brave New World could have been if it was good. The worlds are similar, except for the fetus tinkering. Love and bonding are suppressed by drugs. Life is mapped out for the people. I can see why The Giver is aimed at kids just entering their teens. At this point in their lives, they are becoming separate from their parents and making more and more decisions for themselves. The Giver teaches them that yes, making decisions isn't always easy and you will make mistakes but the alternative is... this. Also, there are a lot of bad things in the world but it is better to face them than hide from them. The ending is ambiguous but, when you think about it, perfect. How better to prove the point of the story by making the reader choose the ending? I was surprised to read that The Giver has been challenged and called "the suicide book." This clearly is a case of 'context is everything.' A society that chooses suicide as a solution to problems is a doomed one. Anyone who read The Giver can draw that conclusion. When Vance was in elementary school, the librarian there loved this book and talked about it a lot. It sounds like it was with good reason. I have not read The Giver since 6th grade, but your review makes me think maybe I ought to revisit it soon. It seems like The Giver does ask some larger questions and I am always down for GOOD not mediocre YA dystopia. ALSO, I am glad I am not the only one who was meh on Brave New World. I also really like your point about making mistakes and decisions and what the alternative is if that ability is taken away. My daughter was so moved by this when she read it in middle school. But I haven't read it yet. Maybe when the little one gets to middle school! I wish I could be shocked about books being challenged, but there seem to be some people out there that don't trust children to draw their own conclusions about anything they read -- which is very, very sad to me. This is one of those books that I feel like everyone has read but me. I've heard it's anywhere from good to outstanding and I may eventually get around to reading it. I really enjoyed this book back when I read it. It was an eye-opener! I get such a kick out of the cover. It does not look like dystopian fiction at all from that cover. I have a copy of this but haven't read it yet. Andi- I could see it being great for that. Kathy- I would agree with that librarian! April- 6th Grade, oh April, I'm so old. I was in university when this book came out. So I'm too old to have enjoyed it in school. BNW was not my favorite book, at all. Col- Yes, this is a thinker and it's important to challenge the next generation to think. Suzi- Definitely give it a shot! Ti- I know, the old man does not scream, "Read me, young 'uns!" 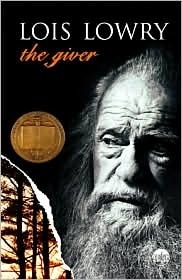 I read The Giver this year too and thought it was what every YA dystopia should be!! Actually, I'm kind of at a loss why they would call it the "suicide" book!!! I love the sentence "The Giver is what Brave New World could have been if it was good" even though I quite enjoyed Brave New World. Heh, I actually really loved Brave New World in high school, and plan to revisit on audio sometime soon. :D I first read The Giver just a few years ago and adored it. I wasn't a huge fan of the ending, but up until that point, it was great. There was one part that I read that literally made me shiver, it was so unexpected (had to do with an apple, and a sled). I think I read this one in my pre-teens but I can't remember much about it other than it was dystopian and that he was in a special position. Perhaps it is time for a re-read! I loved this book! Such an interesting premise and perfect to give kids something to think about. Glad you liked it! I read Giver for the first time a few months ago and it is one of my favorites now. I loved reading your thoughts on it - this book was certainly thought-provoking! Thanks for writing this review! This was always one of those books that wasn't on my radar until I was an adult. I still haven't gotten around to reading it, but I think this is the year!